Pacific Beach Mermaid a San Diego brand NEW REMODELED Modern Beach Vibe Vacation Rental Home; walk blocks to Mission Bay, Crown Point Shores, Mission Beaches, Pacific Beaches, San Diego Parks, Bike Paths, PB Shopping, steps to downtown Pacific Beach PB, Garrett Ave./Grand Ave. with food/drinks, restaurants, activities and SeaWorld. Primo Pacific Beach LOCATION, LOCATION, LOCATION! 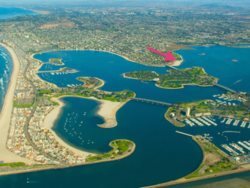 2 blocks from Mission Bay, Crown Point Shores, beaches, bike paths and walking distance to SeaWorld, restaurants & shops yet quiet neighborhood in Crown Point / Pacific Beach "PB". In the heart of “PB”, entertain in a BRAND new remodel, open concept beachy Modern home! Entertain in super open concept living, dining and kitchen spaces. Fully remodeled head to toe but kept the charm: floor to ceiling bay window, hardwood and tile charm. Styled in a Modern/60's Pacific Beach vibe! Super Cool Furnishings, Lighting, Drapes...yes fully remodeled. Trundle Beds are normal beds with real mattresses and frames with an additional mattress/frame underneath the bed that rolls out from the right or left for an additional REAL bed (not a pull out couch or futon). We have a variety of mattresses and pillow construction, i.e. Tempur-Pedic (foam), spring, foam, Sleep by Number and spring and firmness so I can direct you to the best bed for your needs. For your personalized comfort, we have blinds and curtains in each bedroom, extra blankets, two ceiling fans and floor fans. The bathroom and hall linen closets are stocked with extra sheets, pillows, towels, beach towels, toilet paper, soap, conditioning shampoo, flatiron, hairdryer, toiletries and anything you may have forgotten. Book More Weekdays and Less Weekends: Save up to 65% off when you book your vacation for weekend days. Monday, Tuesday or Wed. are up to 65% off! Then Thursdays and Sundays are the next least expensive. Book Last Minute Available Dates for the Current Month: We sell out 25-31 days a month but sometimes we have a few days that month that do not sell, i.e. days after holidays. These dates are 65% off. My calendar is up to date and live. Book Non-high Season or Non-Holiday Weeks. This is a tough one because San Diego has vacation destination all year. The less busy months tend to be non-holiday weeks, events, or graduation weeks of Oct., Jan., Feb., May with great weather. NOTE: We OFFER our Pack & Play, high chair, low chair and Cribs for rent. SPECIAL OFFER $30+tax per day/night! plus a delivery fee..
Master Bathroom 1 - Off Master Bedroom - toilet, shower, Double Sinks, Limestone Counters, Driftwood Cabinets, etc. When I remodeled the ENTIRE house I added TWO master bathroom with the below so you may RELAX in SPA Style: - Large Soaking Tub w/ Subway Tile - Large Shower w/ Subway Tile - Double Sinks w/ Stylish Faucets in both bathrooms - Driftwood Tall Cabinets (easier to brush your teeth) - Limestone Counters - Large Mirrors - Lots of Natural Lights with Windows, Skylights, Can Lights & Fans ....true spa feel! The bathroom and hall linen closet is stocked with extra sheets, pillows, towels, beach towels, toilet paper, soap, conditioning shampoo, flat iron, hairdryer, toiletries and anything you may have forgot. Bedrooms – 10 REAL Beds – Sleeps 16 Total Trundle Beds are normal beds with real mattresses and frames with an additional mattress/frame underneath the bed that rolls out from the right or left for an additional REAL bed (not a pullout couch or futon). • Bedroom 1 – Master Suite with Spa Master Bathroom - 1 Queen and 1 Queen Trundle Beds (Sleeps 4) • Bedroom 2 - Front of House - 1 Queen and 1 Queen Trundle Beds (Sleeps 4) • Bedroom 3 - Back of House - 1 Queen and 1 Queen Trundle Beds (Sleeps 4) • Bedroom 4 – Back of House - 2 Twin Beds and 2 Trundle Twin Beds (Sleeps 4) • Living Room, 4 Comfy Sofa as Deep as a Twin Bed (Sleeps 4) NOT IN REAL BED COUNT We have a variety of mattresses and pillow construction, i.e. Tempur-Pedic (foam), spring, foam, Sleep by Number and spring and firmness so I can direct you to the best bed for your needs. For your personalized comfort we have blinds and curtains in each bedroom, extra blankets, two ceiling fans and floor fans.